Thought you knew what ancient birds looked like? Think again. The ancestors of some modern bird species had four "wings" instead of two, according to a new study, and that may have played a major role in the evolution of early birds and flight. 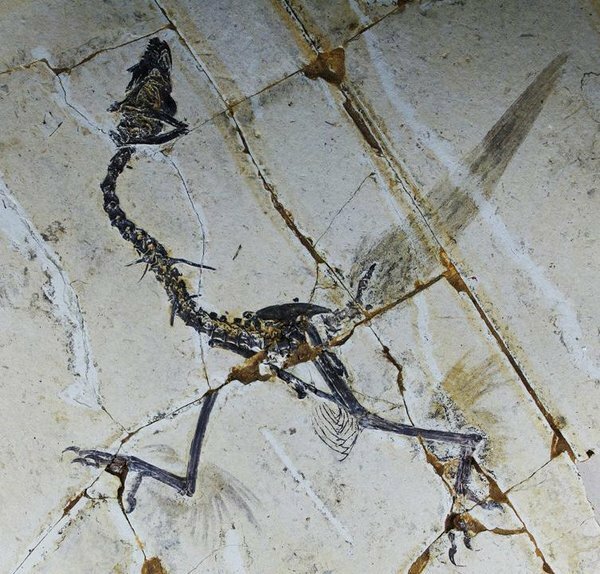 In the study, a group of researchers in China analyzed the well-preserved fossil specimens of primitive birds from the Shandong Tianyu Museum of Nature. They found that 11 bird specimens had plumed legs as well as the usual pair of wings we're used to seeing in modern-day birds. The fossils lived about 130 million years ago. As The New York Times notes, feathered legs have previously been seen in fossils of flying dinosaurs like the Microraptor, a T-Rex relative. It's now generally accepted that the large leg feathers of the Microraptor were useful in flight, but a nagging question long remained unanswered: Did birds go through a "four-winged" stage, or were dinosaurs like the Microraptor merely an evolutionary side-branch? The new study, which published in the journal Science on Friday, has provided the first “solid evidence” that at least some ancestors of modern birds not only had four wings for a time, but also very large feathers on the hind limbs -- a feature that hints strongly at flight. "If an animal has big feathers on its legs and feet, it's definitely something that's not good for fast running," Xing Xu, a paleontologist and one of the authors of the study, told New Scientist. Moreover, Thomas Holtz, a paleontologist at the University of Maryland who was not involved in the study, told NBC News, "the fact that Xu and his team found evidence of leg feathers in a few different species of different sizes [indicates] that leg plumage was fairly common." "We’re really seeing how widespread this condition was," he added. "It’s really clarifying that it isn’t a weird side branch." The two-dimensional nature of the fossils made it difficult for the scientists to "reconstruct the precise location and orientation of the leg feathers," The New York Times notes. "They don’t look like they have a slam dunk case," Michael Habib, a paleontologist at the University of Southern California, told NBC News. Paleontologist Mark Norell of the American Museum of Natural History concurred. "Flight is many things to many people," he told Nature. "The origin of flight is not going to come from just one discovery." Neither Norell nor Habib was involved in the recent study. Still, Habib admitted that the discovery could open doors for future research. "It would not surprise me at all if a few years from now they were proven to be absolutely correct," he said. "I’m just not absolutely sure they’re correct now."